Little Mike - B29 service | Tennessee Aircraft Services, Inc.
CPA held a fly-in at the Cessna Wichita factory in June of 2007 during the Cessna 80th anniversary celebration. There were lots of very interesting historical pictures and documentation on display including pictures of the World War II Boeing B-29 Superfortress. Cessna’s involvement with the building of the Boeing B-29 was news to me and just added one more dimension to my interest in the company. My father was a mechanic assigned to a B-29 during World War II in the China/Burma/India Theater. The ground crew of Little Mike. Dad is the tall guy third from the left. As it turns out, during the war, Cessna was tasked to produce aircraft and assemblies for the military. We’re all pretty familiar with the “Bamboo Bomber” which Cessna produced as a multiengine trainer for the Army Air Corps. They also built outer wing panels for the Waco gliders that carried troops from Great Britain across the English Channel for the invasion of Europe. In early 1944, Cessna began building significant assemblies for the B-29. Shortly after the fly-in I got a copy of Jeffrey Rodengen’s book The Legend of Cessna and learned even more about Cessna and the B-29. According to Rodengen, Cessna produced 1,400 vertical stabilizers, 1894 rudders, 1658 heat exchangers, 1619 pilot and co-pilot instrument panels, 1536 dorsal fairings, 1567 elevators, 1343 wind leading edges, and 1583 rudder pedals. Not a whole airplane but enough Cessna influence to use it as an acceptable excuse to write this article for the CPA magazine. The B-29 had some amazing capabilities that never quite fit the theater in which they were deployed, until the end of the war. Many of the B-29s were based in India to keep them a safe distance from Japan. This required many cargo plane trips to forward air base in China with all the supplies needed to make a bombing run. After all the supplies and bombs were in place, the B-29 would load up the mechanics and the bomb bays with fuel tanks for the flight over the Himalayan Mountains to the forward base in China. Once there, the mechanics and extra fuel tanks were off loaded and the plane prepped for the bombing run to Japan. This whole process might take 4 weeks to yield a single bombing run on Japan. One of the rare times when Little Mike could be in the shade for work. The large tank on the floor in front of the plane was used for the trips to the forward base in China. My Dad left Texas Tech as a junior in the mechanical engineering school to join the army and build runways for the Air Corps. While in one of the military orientation classes, someone walked in and said they needed volunteers to be airplane mechanics; “you, you, and you, come with me.” Not long after that he’s on a boat to India to work on the Superfortress. The Superfortress was leading edge technology in its day. Press that new technology into the urgency of a world war and you have a recipe for continual problems and change. The changes were coming along so fast that many planes just off the assembly line would be held up for deliver to make urgently needed upgrades prior to going to war. Dad remembers the engines were being pushed to their limits in the high temperatures of India. There were frequent engine fires and lost cylinder heads on take-off. The four big Wright R-3350 had twin exhaust driven turbo superchargers boost the horse power and allow high altitude operations. This was a very unique system and probably contributed to the reason Dad remembers changing the engines every 300 flight hours. The planes routinely took off in very hot ambient temperatures with heavy loads which was a strain on airplane performance. Pilots were known to push the turbo boost up higher and higher on take-off as the far end of the runway got closer and closer. Dad remembers calling the pilot on the intercom just after takeoff one day, while sitting in at one of the aft windows, to tell the pilot that some unattached engine parts just passed by. Apparently, a little too much boost blew a cylinder head through the cowling. The whole crew got involved pulling the engines through backwards to relieve the hydraulic pressure in the lower cylinders before a start. On the “ferry” flights from India to China, the planes would have to climb to pretty high altitudes. The low ambient temperatures made it difficult to keep the oil temperatures up which caused fluctuations in the constant speed propellers. At the time, the cause wasn’t fully known and it was one of those frequent points of discussion between flight crews and mechanics. Many of the barracks were located just off the end of one of the runways at the base in India. As the B-29 was known for take-off accidents, the base commander needed a way to give the pilots night time departure path to follow away from the barracks. The idea was to place a series of vertically shinning spot lights arranged in an elliptical pattern from the end of the runway going away from the barracks. These could be easily turned on at night when needed but not pose an obstruction. The problem was finding someone on base with the know how to lay out the lights in the elliptical pattern. A review of the base roster found Dad was the closest thing to an engineer they had. So Private First Class Joe New was temporarily pulled from mechanic duty to layout the departure lights. I wonder if they published a SID? The Superfortress could fly up to 35,000 feet, it didn’t do this often, but it could. 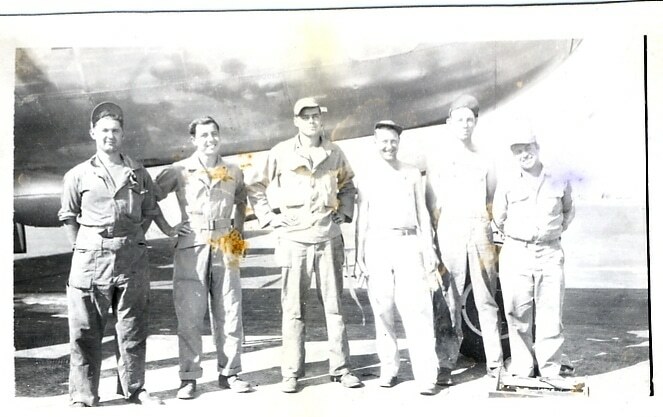 The group that Dad’s plane was in did usually cruise high enough that enemy fighters were not a significant problem. Apparently the two cannons in the tail of the planes were more useful elsewhere so the mechanics removed them and installed broom sticks. The theory was that just the sight of something that looked like a couple of menacing cannons was sufficient to make the occasional pursuer reconsider the effort to climb high enough to attack from the rear. Most of the crews were pretty young, usually in their early 20s. The oldest pilot at one point was 26 and they called him “Pappy.” The wife of the pilot of the plane Dad was assigned to had a son named Mike shortly after deployment. They called him Little Mike so, in honor of his new son, the pilot named his plane “Little Mike.” We’ve not been able to find out much more about the plane other than the nose art had “Little Mike” painted on it. We know that Little Mike was one of the many Superfortresses flying over the USS Missouri during the signing of the Japanese surrender. Dad tells about being on that flight, which I’m sure he wasn’t supposed to be, and seeing all those planes circling in chaos and filling the sky. We also have a pretty amazing picture he took of the Missouri in which one can clearly see the deck all laid out with the table ready for the formal signing. The story goes that Little Mike had to “deviate” from the formation to get close enough for the shot. In 2006, I was able to take Dad and my son Jared to Airventure specifically so we could all three see FIFI and get some pictures of us with the much storied B-29. Unfortunately, that was the year they discovered some problems with the plane and cancelled the appearance. Dad is almost 91 now and was not able to make the trip to Airventure this year to see FIFI fly. Fortunately, a friend let us know that FIFI would be stopping in nearby Memphis on her way home for a short display visit. A few calls were made and some favors requested and we were able to arrange an early morning viewing of the plane before the regular crowds arrived. Dad is limited to a wheel chair so he couldn’t get inside but just being up close and touching the plane brought back many memories. Probably taken on one of the long flights over the Himalayas. The pilot was crazy enough to let Dad sit at the controls long enough to get a picture. Dad was sitting under the right wing taking advantage of the shade and talking about “his” plane Little Mike. There were several people around with cameras and I noticed one young lady with a very expensive camera suddenly left the area. A few moments later she returned with a gentleman and was pointing at Dad. He approached Dad and asked if he flew Little Mike. Dad responded that he was assigned as one of the mechanics and not the pilot. The man then introduced himself as “Little Mike.” It took a few seconds for it to sink in but it was a powerful moment. Everyone in the area was amazed and the cameras began clicking. It was an exciting day for sure. As it turns out, there were two B-29s with the nose art “Little Mike.” The little Mike we met was a bit young for World War II but we discovered his father flew a B-29 in the Korean conflict and was shot down and captured. He has still not been returned to his family. We’ve still not discovered the full story of the 2 “Little Mike’s” but the reunion was a thrill none the less.